Following her commissioning at Boston, Massachusetts, Perth (II) spent eight months in American waters conducting trials and exercises. On 12 February 1966 she sailed for Australia arriving at Perth on 4 March where she was granted Freedom of Entry. From September 1967 to April 1968, September 1968 to April 1969 and September 1970 to April 1971, Perth (II) served as a unit of the US Seventh Fleet operating off the coast of Vietnam. The ship was awarded the United States Navy Unit Commendation after her first deployment, and the United States Navy Meritorious Unit Commendation after her second deployment. 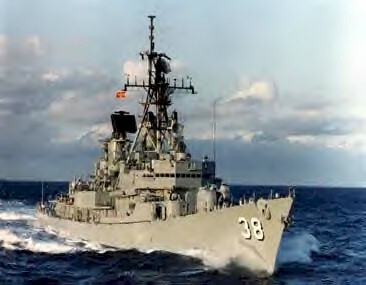 In all, Perth (II) steamed over 149,000 miles on active service in the Vietnam War, fired some 30,711 five- inch rounds and came under fire on five occasions. Perth (II) had a tremendous career that spanned 34 years in periods of conflict and of peace. There have been many notable highlights since the days of the Vietnam gun-line. In 1973 Perth (II) made a notable good will visit to Massawa in Ethiopia where His Imperial Majesty, Emperor Haile Selassie, dined onboard. In July 1974 she sailed for her first modernisation at Long Beach, California where the new Naval Combat Data System (NCDS) was fitted along with new gun mounts and the upgrading of the missile fire control system. In 1978 Perth (II) took part in the independence celebrations of Tuvulu – formerly known as the Ellice Islands – and in 1979-80 she underwent another major refit and was converted to burn diesel oil instead of furnace fuel oil. She spent two stints in the North West Indian Ocean patrolling the Arabian Sea during the Iran-Iraq war in 1981 and 1982 with the USS Ranger and John F. Kennedy Battle Groups. In October 1985 Perth (II) was involved in the rescue of the crew of the Singaporean MV Hoelien during exercise Coral Sea off the NSW coast. She commenced her second modernisation in February 1987 which included major upgrades of her search radar, NCDS, gun systems, communications equipment and modification of the Mk13 launcher. Perth (II) returned to Egypt and Greece in 1991 to mark the fiftieth anniversary of the evacuation of Greece and Crete before passaging to New Zealand to celebrate the fiftieth anniversary of the founding of the RNZN. She has regularly lead many ships, as the Navy’s senior destroyer, to a multitude of countries and oceans, including the 1997 visit to the Chinese naval port of Qingdao. In her final operational deployment in 1999 Perth (II) commanded six Australian ships a head of Task Group 627.5 and Perth (II) visited the shores of Guam and Saipan; ventured to Corrigidor Island at the mouth of Manila Bay; engaged in some unscheduled manoeuvres with the Chinese Navy and put chase to pirates and smugglers. Many members journeyed to Hellfire Pass and Konchanaburi during the ship’s Bangkok visit and a deeply moving memorial service was held at the site of Perth (I) in Sunda Strait. Perth (II) also conducted the first visit of an Australian warship to Vietnam since Australia’s withdrawal in 1972 when she visited Ho Chi Minh which coincided with Anzac day. In her final voyage to Australian ports the privilege of the freedom of entry to the city of Perth was exercised for the final time. 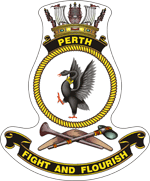 Over 7000 officers and sailors served in Perth (II) during her period of service. She steamed over one million miles during her career she has won numerous fleet Awards for excellence. Perth (II) had grace, speed and power, and the capacity to turn heads with fine lines and is fondly remembered as one of Navy’s quiet achievers. In 2001 Perth (II) was sunk as a dive site near Albany. For Exceptionally Meritorious Service from 9 September 1967 to 5 April 1968 in the planning and execution of combat missions against enemy aggressor forces in direct support of Free World Objectives. While operating as a unit of the US Seventh Fleet, HMAS Perth delivered extensive, destructive naval gunfire again enemy supply routes, coastal defense sites, troop concentrations, and fortified positions in both North and South Vietnam. The prowess and teamwork displayed by the personnel of Perth were uniformly characterized by personal valor, professional acumen, and individual initiative. Although often within the range of enemy coastal defense sites, Perth quickly responded with skill and resourcefulness, silencing enemy batteries while manoeuvring adroitly to avoid sustaining any damage or injury to herself. As an element of Task Unit 70.8.9 HMAS Perth provided Naval Gunfire Support for United States and Allied Forces ashore in the Republic of Vietnam, and as an element of Task Group 77.1 in the Gulf of Tonkin, supported Naval Operations against North Vietnamese logistics groups and lines of communications. The tenacity, professionalism, and dedication demonstrated by the officers and men of Perth reflect great credit upon themselves and the Royal Australian Navy. For meritorious service from 24 September, 1968 to March 1969 while participating in combat operations against enemy aggressor forces in South East Asia. As a member of the United States SEVENTH Fleet assigned to SEA DRAGON operations, HMAS Perth contributed significantly to SEVENTH Fleet combat operations by conducting numerous successful fire missions against heavily defended enemy logistic installations and lines of communications. When Perth was engaged by enemy shore batteries on two occasions, the combination of her crew members’ spirited teamwork and capable leadership produced quick and precise evasive action to spare the ship any material or personnel casualties. Perth‘s high accurate fire inflicted heavy losses on enemy assets and was instrumental in assuring the success of allied operations wherever she was stationed. The outstanding performance, superlative accomplishments, and inspiring devotion to duty displayed by the officers and men of HMAS Perth throughout her deployment, reflect credit upon themselves and the Royal Australian Navy.